You don't have to be Scottish to appreciate bagpipes or the grandeur that they project. Nothing exudes the illusion of the grandeur of an occasion or event as the use of a bagpiper can. Pomp, pageantry, majestic dignity and stateliness are all words that spring to mind when one uses a piper. You can create this same grandness when you engage a musician from Pipers of Distinction. It’s a fantastic way to honour your heritage or to add something that is totally different within the local culture of the country you decide to get married in. 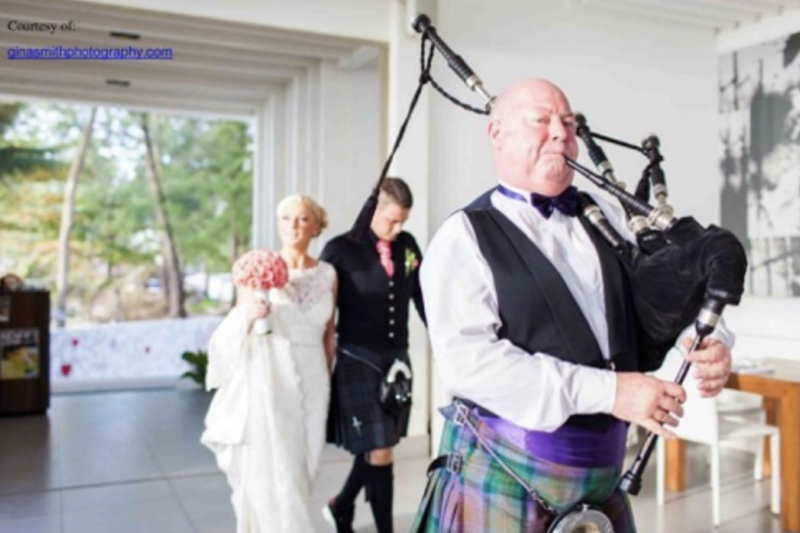 We can supply a piper, dancers or pipe band anywhere in the world. Using a piper to promote a product or event is a great way to attract attention. In a country where a bagpiper is not the “norm” people flock instantaneously to see what is happening. Bagpipers are used all over the World for various events and grand occasions. Just think how excited your you're friends and family will be when what they thought would be an impossible request is made possible by you, simply by contacting Pipers of Distinction. Please feel free to contact us at anytime. By phone or email as we would welcome the chance to discuss with you personally, how we could be of assistance to you and your family.